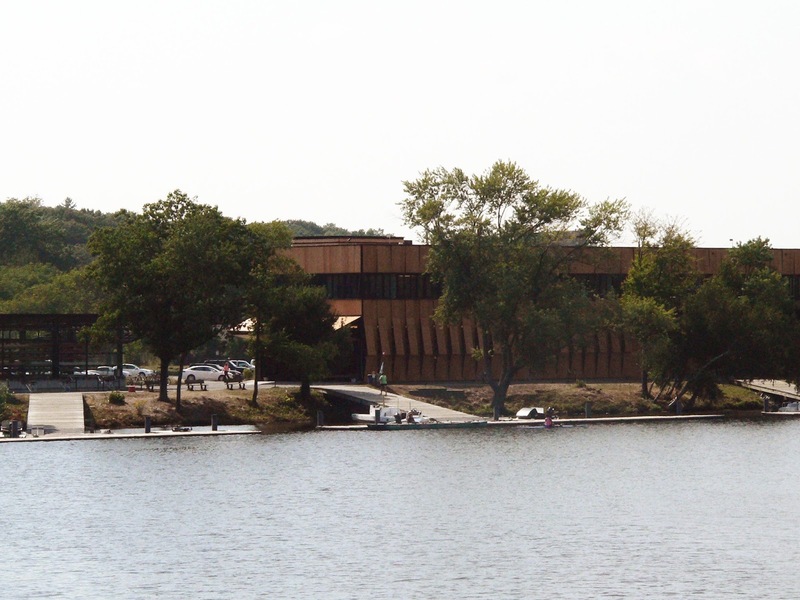 If you have been at the BAC for more than a semester, you have no doubt heard about the Harry Parker (or Community) Boathouse in Brighton. 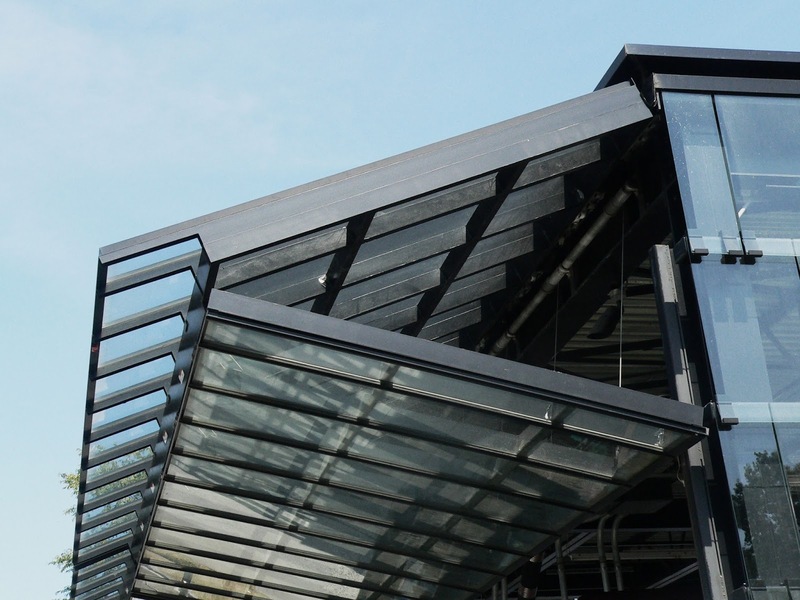 Instructors and students alike rave about the efficiency of materials, creative cladding, and easy accessibility of this building. In 2010, The Boston Society of Architects bestowed the honor of "Most Beautiful New Building" on the boathouse designed by Alex Anmahian and Nick Winton. As Alex discussed at the Convergence: Research as Practice symposium, the boathouse was inspired by three disparate concepts: tobacco barns, hangars, and billboards. Tobacco barns are built with louvered walls, like venetian blinds, to allow air flow to dry the leaves as quickly as possible. Rowing houses have a similar problem to solve -- how can hulls dry fastest? Anmahian Winton built motorized louvered walls that can open when air flow is needed, or closed to keep out the elements. Airplane hangars influenced design by dictating a long narrow storage space with vertically-folding doors at either end. 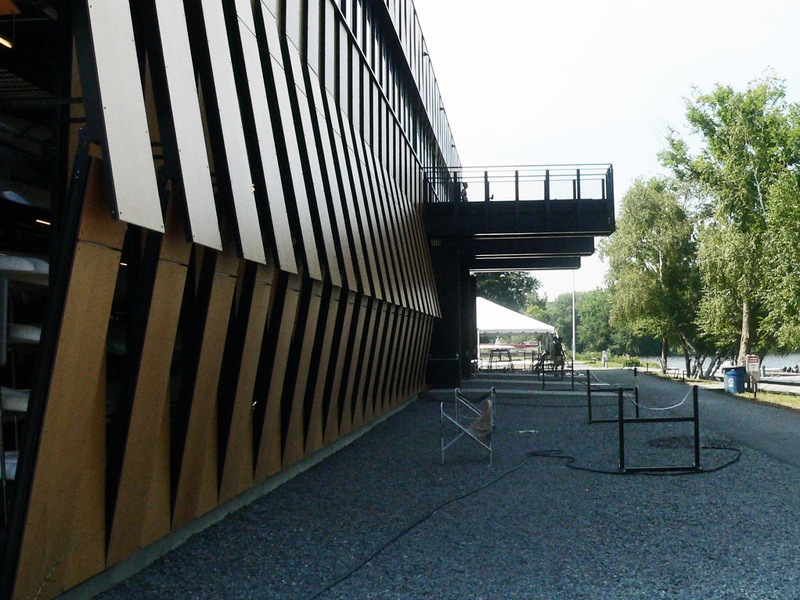 Anmahian Winton realized that the site, alongside I-90, would be seen by countless drivers, so the front facade uses cladding that continues the visual vocabulary of louvers and water to act as an identity and billboard for the rowing center. The boathouse is sited on an easily accessible plot. The proximity to I-90 allows rowers from the suburbs to jump on and off a main traffic artery. A walk/run/bike path runs through the site and the designers purposely pushed the building back from the river to allow runners and cyclists to continue their rides along the river unhindered. A bike ride from the BAC should take just over 30 minutes using the Esplanade and Dudley White Bike Path. 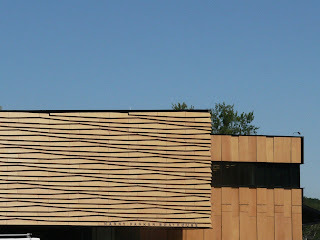 To erect the building on a tight budget, Anmahian Winton used modular design and repurposed parts. 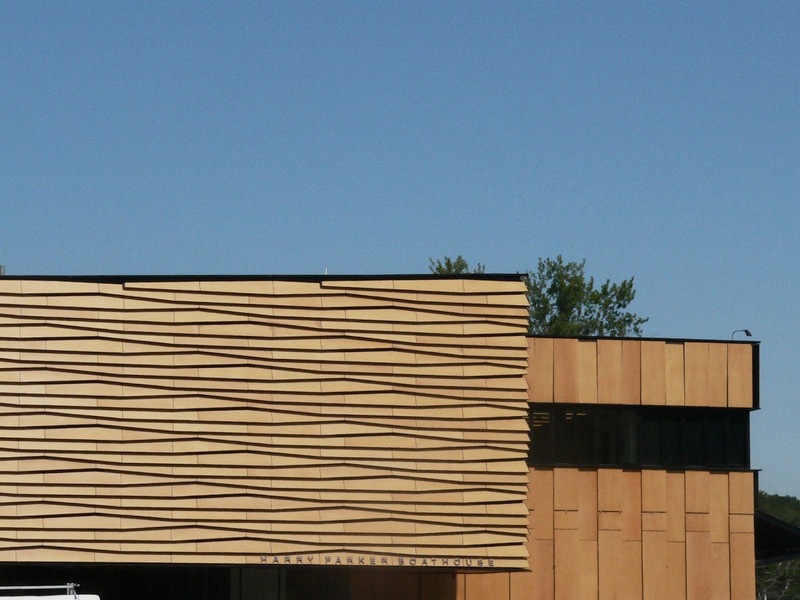 The cladding on the front facade looks like a custom design, but it is in fact a very limited set of shapes laid out in a visually stimulating pattern. A smaller sister scullhouse uses similar techniques as the main boathouse, but instead uses regular glass panels as the envelope. 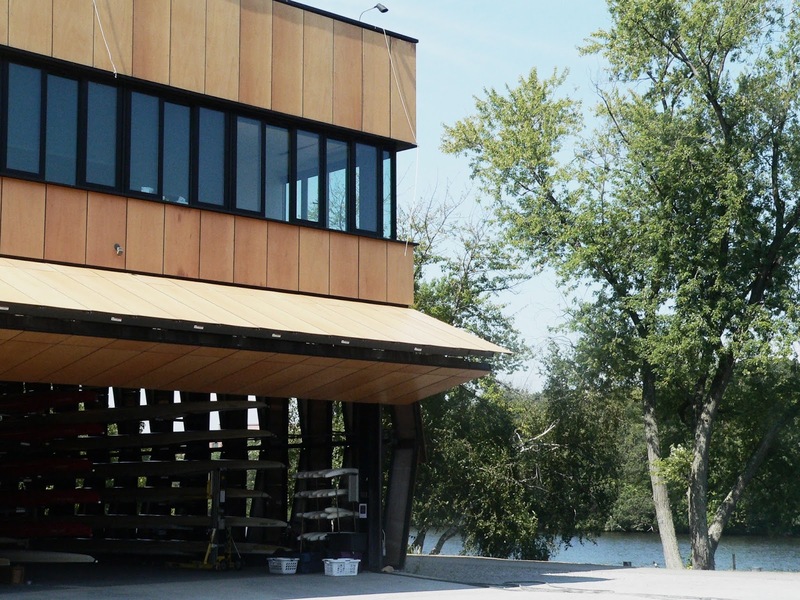 It is no wonder that the boathouse gets so much attention. So many aspects of design are executed with efficiency and creativity, a feat that many architects are unable to pull off. It's not a large building, but the design process and methods of construction allow for hours of meditation and inspiration. The interior lights shining through the gills at twilight are stunning!